TonkaPW wrote: This is an awesome build project. I love how you used the existing gas openings for the electric and water. The only thing I would change out would be the ball hitch for a pintle hitch. I have seen ball hitches pop loose in extreme conditions but I have never lost anything with a pintle hitch. A pintle hitch that swivels would give you all the articulation you would ever want with twice the straight. Looking at the links provided I would be concerned about breaking the hitch if you find yourself in a situation that causes the trailer to get bound up. With the pintle I have seen guys bend things but never lost the trailer. OK, finally got back to taking some pictures and posting an update. I am more or less done ("done") with the trailer. Just a few small items that have come up as nice-to-haves after its first limited use. 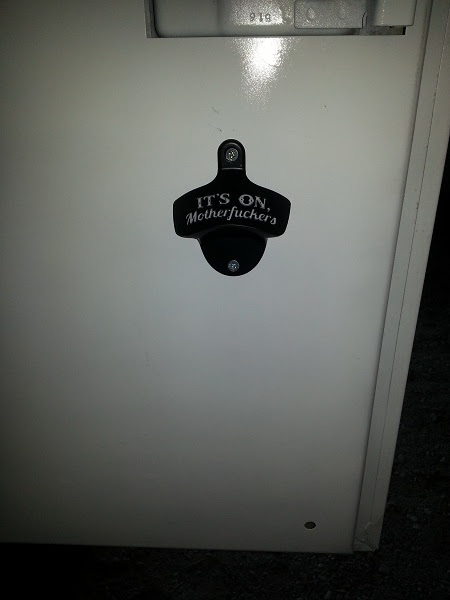 Like a bottle opener mounted near the fridge. Still have to save the funds for a small propane fire pit and a small generator (both from Costco, might be getting them this week). Also waiting on a double propane tank mount/hold down from Amazon. Here is where it sits right now. New locking hitch, power connector, new jack. 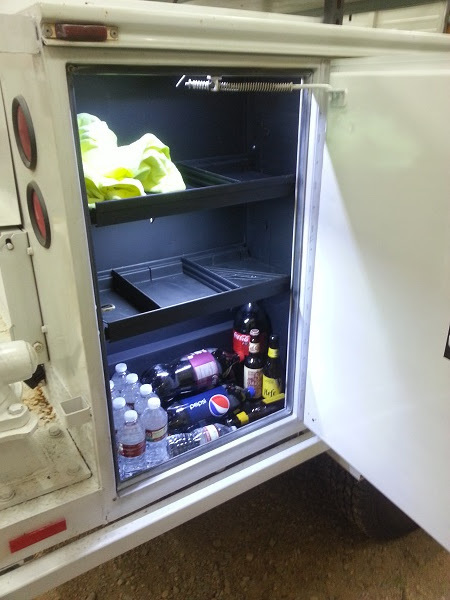 Inside the front tool box. Has two propane tanks, some tarps, a couple of the 1lb tanks, my tire chains, a 4 gallon gas can (for the 2k watt generator that I will have, should be a solid 5 days worth of normal use to charge battery and what not), and some leveling blocks. The fire pit will fill up the empty space perfectly. Front box with new spare tire carrier. Can also be used as an umbrella mount (umbrella slides into the vertical tube). Front left compartment. Has the battery, AC charger, solar charger, fuse panel, switch panel and gauges, extension cord, fire extinguisher, wheel chocks and some misc stuff. The lighting is powered up by the lighted switch, then is turned on by a door switch when each door is open. This switch also powers the three 12v outlets onboard. Switch panel. From left to right: under lighting, solar charger, fridge, water pump, cabinet lighting/12v outlets, tent power, spare, gauge turn on switch. Power inlets. AC plug with my solar panel connectors on top. View of the under lighting (rock lights). 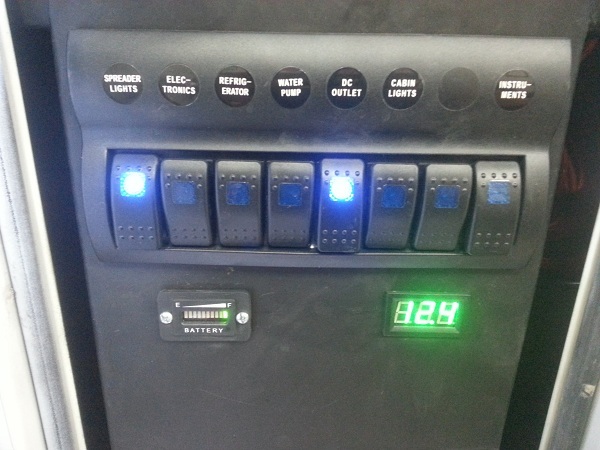 Will turn on when I turn on my truck rock lighting, or manually turned on from the switch panel. Middle left compartment. 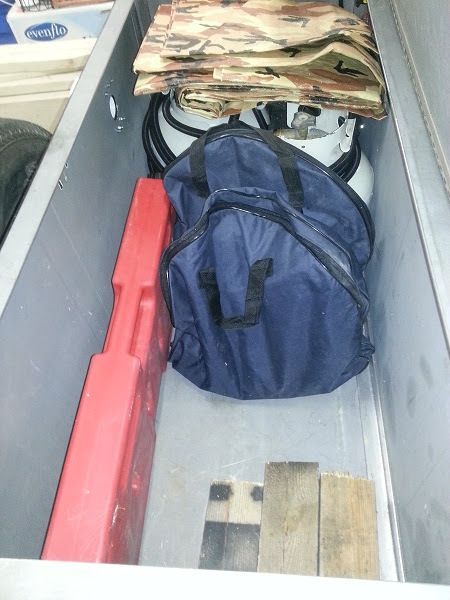 Houses the inverter, jump starter, radio, a 12v fan, some misc items in the bags, and a 12v vacuum. Water inlet/outlet. I have a misting system that hooks up to the hose outlet for our pop up canopy. Water tank and view of the piping/wiring/gas hose. 21 gallon tank. Left rear compartment. Sink, hose, misting stuff, first aid, hand sanitizer etc...I have a 5 gallon bucket that gets placed under the trailer for the sink to drain into. View into the rear cargo area. Yes, that is an A/C unit. Will run off the generator (or limited use off the inverter). It mounts up to the tent. 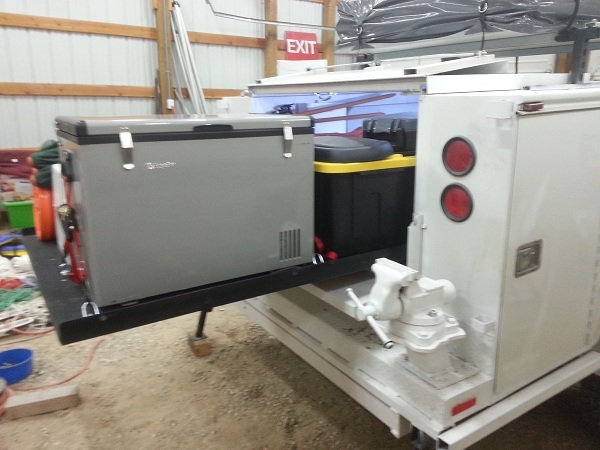 Inside the rear compartment with the slide out. There is room for storage behind the slide. I also have my solar panel and a table in here, next to the water heater and fire extinguisher. In the front I have a propane heater, some more folding tables, misc camp items, some more tarps (heavy canvas). Easy access to the fridge. Umbrella holders. They work out quite nicely. Can also see the back up lights. RIght rear compartment. This is the pantry. Already has some left overs from the BBQ this weekend. Used the trailer and it worked great. Middle right compartment. Houses the stove (has a propane hookup) and commonly used kitchen items. The picture for this one got corrupted on my phone. Front right compartment. Kitchen storage space. Very happy with the way things turned out. Just need to test things out some more to make sure it will hold up then start using it. This is great! Well done Sir! just wow. that is all I can say. you need to build and sell these guys. I bet there is a huge market out there for trailers of this kind. quick question. where did you get your water tank. I have a leak in my rv water tank and its beyond repair. I honestly think I would get burned out if I did my hobby for a job. This trailer has certainly been a conversation starter already, just wait until I actually take it camping. dogcar3 wrote: Thanks for the comments everybody. That's why I stopped working for Mazda NAO. I was getting burned out and automotive just wasn't fun anymore. I just use my education for fun now and I'm much happier. Wow. I'm always a lot amazed, deeply impressed, and a little ashamed by all of the really talented folks on this site. I have a lot of personal skills in desperate need of improvement. Your setup is miles ahead of some of the "professional" ones I have seen! I think you could definately turn this into a money making venture! I would definately buy yours over any of the others that I have seen out there. The only thing I would add would be a swivel hitch for those of use who tend to make there own trails when moose hunting---lol. Just curious, but how much do you think it weighs fully loaded and ready for an adventure? A swivel hitch of some sort is definitely in the plan, probably won't happen until after this season, we got too much stuff going on for the down time. I have been really wanting to weigh it, but there are only two scales that I know of around here. One at the metal recycle place, and one at the sand/gravel pit. I may be making a trip to the recycle place here soon to remove some scrap. I see a contest-----predict the final weight! My guess 3300 lbs fully loaded. bajaben48 wrote: quick question. where did you get your water tank. I have a leak in my rv water tank and its beyond repair. X2 on the weight question. That thing looks awesome and definitely sets you up for being comfortable and hosting a hell of a party wherever you stop! My only worry would be towing something that heavy up a trail with the ball hitch. Those things aren't meant to vertically articulate much, especially with a good amount of weight on them. I'll have to take some pictures of my setup and post em, but I definitely tend to find a spot to camp, drop it and then go wheelin. Wow. That's not too bad. It's a lot like towing a Jeep on a trailer. 4000 lbs is not that much for our trucks at all..............as long as you ain't running the Rubicon Trail. Just fine for moderate wheeling & camping. Thanks. We have been talking about the Magruder trail in Idaho this summer. Among other things. Definitly not an extreme trailer. But also not extreme price. I would like some bigger tires and an off road hitch. But it has worked just fine as-is so it is hard to justify the money. Definitely a lot of luxuries to get the better half to go. But better in the trailer than the truck. We drop the trailer at camp then go have fun in the truck.